VOTED BEST BY ASBURY PARK PRESS READERS! THANK YOU! Family owned & operated by John Case, his family & a team of dedicated professional drivers, driven by one common goal...to safely get YOU our customer, to your destination in a timely & safe manner, in the most economical way. 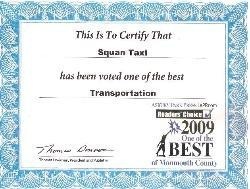 With courteous service as our primary goal, we believe you'll find we are second to none, & will continue to use us for all your transport needs for years to come! AIRPORT SERVICE TO ALL MAJOR AREA TERMINALS. SERVICE TO ALL LOCAL BARS, CLUBS, RESTAURANTS. OR 732-280-8830 MAKE RESERVATIONS ONLINE NOW!